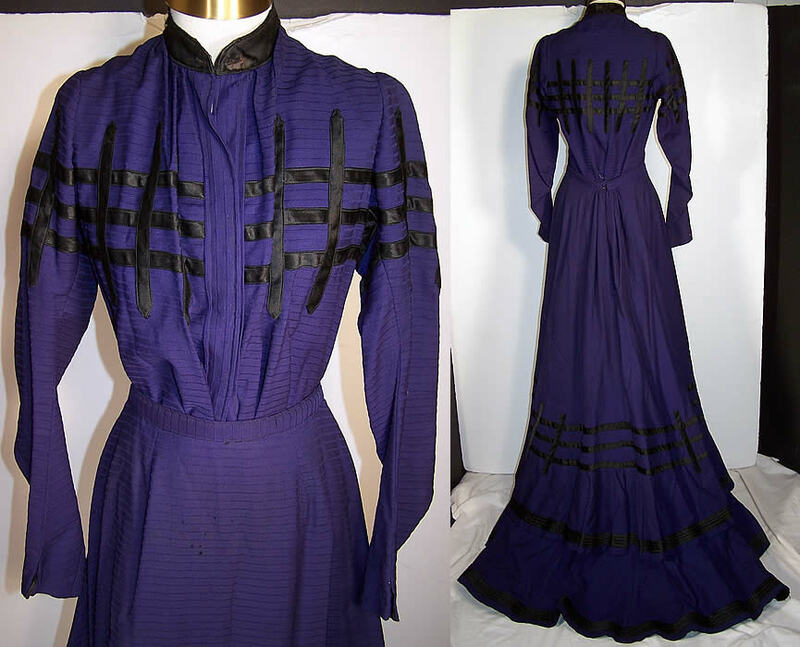 This antique Victorian era violet purple wool, black lattice visiting gown, dress, bodice, skirt train dates from 1900. 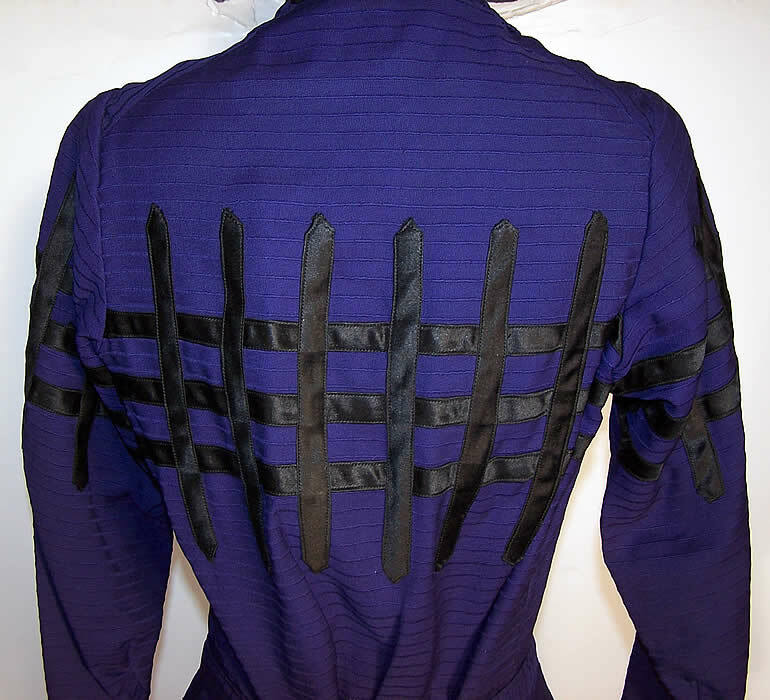 It is made of a dark bluish purple violet color textured ribbed wool fabric, with black silk satin appliqued lattice work fence trim accents. This beautiful visiting gown traveling dress has a bodice, with pouter pigeon front, black satin band neck collar, long tapered sleeves, with hook & eye closures down the front. It is fully lined in a white muslin, with stays boning sewn inside. The bodice measures 21 inches long, with a 26 inch waist, 34 inch bust, 11 inch back and 24 inch long sleeves. 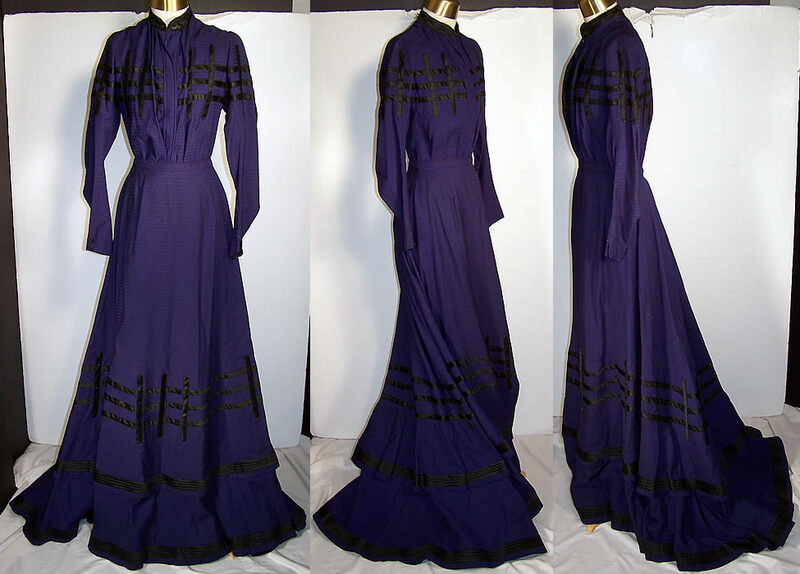 There is a matching long floor length skirt, with a layered black soutache trim bottom and pleated gathering on the back drape train. It is fully lined in a black polished cotton fabric. The skirt measures 42 inches long in the front, 48 inches long in the back, with a 24 inch waist. It is in good wearable condition, with some tiny moth nip holes on both and the collar has some fraying. The skirt has an area in the front near the waistband, with several small age spots stains and moth holes. This is actually an early Edwardian in style. Probably just around 1905 give or take a few years. Very lovely!